Youth and Older Adults break down inter-generational barriers and present their issues and realities! Come see the results of our Speak Out With Art! week long workshop series! For more information please email info@mixedcompanytheatre.com. Supported by the Ontario Trillium Foundation and in partnership with UrbanArts, MCT facilitated 2 separate week long workshops with a group of older adults and youth. Each group created a forum theatre presentation based on their inter-generational issues. 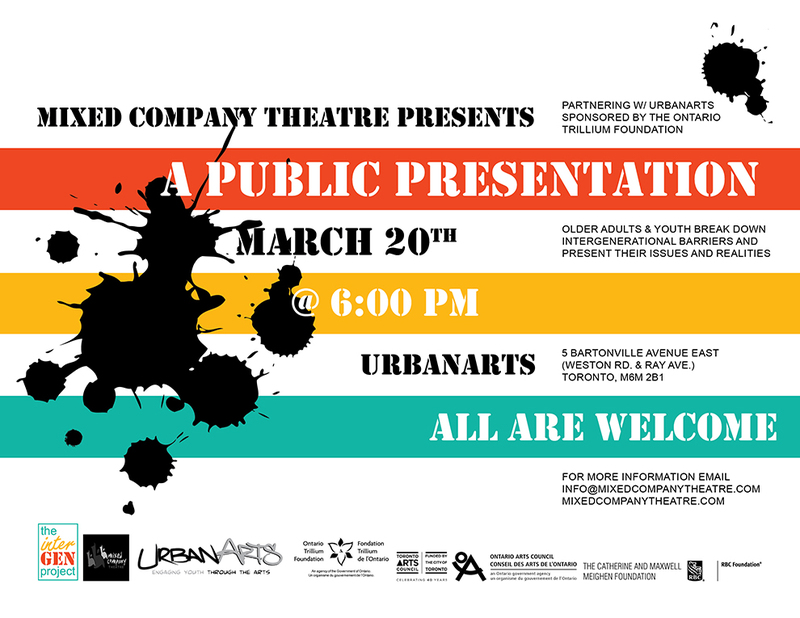 Watch, on March 20th, as both groups face off in the theatre, perform their presentations and then ignite conversation about what divides/unites these two communities! Share our Intergen Presentation Poster!